Adults who wish to learn to play piano often have a hard time learning the way children do--with the basics and from the beginning. This is because adults often feel they don't have enough time to put into the practice required with traditional piano methods. Adults also have a tendency to want to perform a desired goal . There are special piano methods aimed at adults who think this way. Here are some tips and methods you can use to teach adult students how to play piano for enjoyment. One of the best methods for teaching adults to play piano is the chord approach. Learning to play chords is one of the quickest ways to get to playing songs you recognize, which is what many adults with a desire to learn how to play piano want to do. 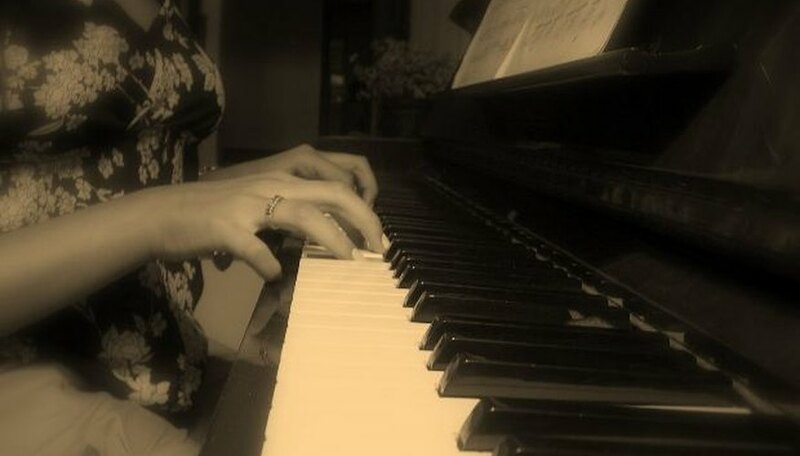 Most adults who take up piano playing late in life are not interested in learning music theory or even reading music beyond the basics it takes to play their favorite songs. If you want to teach an adult, start with a basic piano chord book or find one online free of charge. Teach melodies. Piano teachers always put young students to work with playing scales in every key. Adults rarely feel they have the time to learn scales. Older adults often feel they don't have the ability to learn scales. Using simple melodies rather than scales is a good approach to teaching single notes on the piano without forcing the issue of scales. You can purchase piano books in a music or book store that feature simple melody lines (usually the vocal line) and use these melodies to teach adults how to read music notes on the music staff. Introduce sheet music to the lesson plan right away. Music stores are filled with books that contain simple songs with nothing more than chords and lyrics. The best way to keep an adult's interest is to teach him how to play songs he recognizes. It also creates an immediate sense of achievement. Playing songs by chords isn't difficult to teach, and it isn't hard for the student to perform. Encourage adults to sing along as they make the chord changes to add another level of pleasure and accomplishment to the lesson.